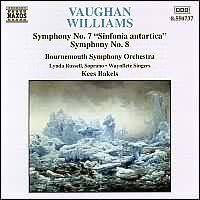 Classical Music on the Web (UK) CD Reviews - January1999 : VAUGHAN WILLIAMS: Symphony No. 7 & 8. I do not regret this journey: we took risks, we knew we took them, things have come out against us, therefore we have no cause for complaint. These poignant words preface the last movement of the Sinfonia Antartica and are in a nutshell, the kernel of this full-blown symphony. Vaughan Williams must have felt inspired by the heroisms and tribulations endured by Scott and his team and this is felt in the chilly scoring that permeates the piece. We have had many satisfactory recordings over the years. One recalls the trailblazingly magisterial Barbirollis world premiere recording and the trenchant spirituality of Boults equally fine 1953 Decca recording, both records that have stirred the memories of the avid collector for decades. I can still remember those haunting final bars creating such a sense of desolation that I was stupefied for days on end after a listen to the Boult recording. His 60s remake was not a patch on that unique occasion. This brings us to this splendid recording under review. Kees Bakels has not always been lauded as an exemplary Vaughan Williams interpreter. His exciting recordings of the London and the Third and Sixth have been treated with some disdain if not plain dismissal by some reviewers. Personally I thought that the BSOs playing in the Third Symphony was exquisitely beautiful and the rich Chandos recording rivalled the more superior Handley performance although that is in a league of its own. Curiously a few years since Naxos last issued that disc and this excellent coupling has been worth the long wait. The first real bonus is in the Movement superscriptions provided on disc. These are eloquently read by David Timson (of Sherlock Holmes Naxos fame) and none makes more moving listening than the one quoted in the preface to this review. Bakels directs with a firm commanding hand and lavishes great care on the four movements. The First Movement is boldly eloquent with a really majestic Andante maestoso that leads into a spirited Poco animato. The Bournemouth brass are heard in their impressive full cry and the ending of the movement is also shatteringly bleak. The Scherzo is also blisteringly vivid; here we can almost imagine Scott and his company making their way through snowstorms and glaciers. The same goes for the forbidding Landscape which teems with orchestral detail. Bakels slowish tempi create that right sense of mystery that is the tonic to our musical inspiration. Wind machines and percussion are married with some glorious climaxes and here we can appreciate the full strength of the BSO. And Bakels really scores in the majestic Epilogue, I would go as far as saying that those final 50 bars are almost as haunting as Boults own. The choral contributions are also winningly done and Lynda Russell is particularly succesful in her wordless enunciation. In the Eighth, one of RVWs most enigmatic symphonies, Bakels has his work cut out to match his earlier superb effort. This work is rather mysterious to many but it carries the quintessential RVW charm through its symphonic veins. I enjoyed Bakels in the Fantasia although there is that much more passion in Handleys excellent RLPO account on EMI Eminence. The wind instruments have a field day in the short Scherzo whilst the cavatina holds that wistful mood in abeyance. The Toccata disappoints a little although the superb Naxos sound more than makes up for that. The disc is superbly engineered throughout, a brilliant production by Andrew Walton and his K & A team. Naxos could not have chosen a more superb cover, the Glacial Sea is indeed the perfect accompaniment to this rather exceptional release.